Epilepsy is a brain disorder that strikes humans as well as pets. While this condition is relatively rare in cats, it is common in dogs. Unpredictable, recurring seizures caused by an electrical ”storm” in the brain are the hallmark of epilepsy. A diagnosis of epilepsy is made only after all other reasons for such seizures have been ruled out. Although there is no cure for epilepsy, frequent seizures can typically be managed with drugs. A seizure consists of spontaneous, uncontrolled movements such as trembling, twitching or leg paddling, or changes in consciousness or behavior, which are caused by electrical abnormalities in the brain. Seizures can be localized, such as in areas of the face, or generalized, involving the entire body. During a seizure, a pet may salivate, and lose bladder or bowel control. It is common for pets to appear disoriented for minutes or hours after a seizure. In many cases, a seizure may be an isolated event, brought on by any number of reasons, such as low blood sugar, infectious diseases, toxins, kidney or liver failure or trauma. Anything that puts pressure on the brain, such as a tumor, can also cause seizures. Treatment of the underlying cause can often resolve the seizure activity. When seizures recur over a period of weeks, months and years, the condition is known as epilepsy. Epilepsy is often called “idiopathic epilepsy,” meaning that the exact cause of recurring seizures cannot be identified. Epileptic dogs can present at any age, but most will make their disease known via owner-observed seizure activity before the age of five. The condition may have varying degrees of severity and amenability to treatment. While very mild cases carry an excellent prognosis, a few dogs can suffer from an intransigent form that leads almost inevitably to euthanasia. Most dogs, however, fall somewhere in the middle. Based on the evaluation of breed and line-specific predispositions to epilepsy, it’s suspected that this disorder may be inherited. The mode of inheritance, however, has not been worked out and seems to vary depending on the affected breed. Multiple genes may be involved in some cases. Signs may vary widely in terms of the length, frequency, and general manifestation of the seizures. Generally, signs may include trembling, twitching, paddling of limbs, salivation, urination, defecation and changes in consciousness. While most seizures only last a few minutes, pets experiencing seizures of longer duration should be seen by a veterinarian immediately. In most cases, the timing of the seizures is effectively unpredictable. Typically, idiopathic epilepsy is diagnosed only after all other obvious causes of seizures have been eliminated from the list of possibilities. A physical examination and basic laboratory testing (complete blood count, chemistry, urinalysis) are usually recommended. Toxicology studies, specific testing for infectious diseases and cerebral spinal fluid analysis can be very helpful as well, especially for patients with severe or seemingly progressive symptoms. Advanced imaging studies (MRI or CT scan) are strongly recommended for middle-aged to older animals to rule out the possibility of brain tumors or other lesions. Epilepsy can occur in all breeds of dogs. Those most affected include the Belgian Tervuren, Beagle, Bernese Mountain Dog, Cocker Spaniel, Collie, German Shepherd, Golden Retriever, Irish Setter, Keeshond, Labrador Retriever, Poodle, Miniature Schnauzer, Saint Bernard, and Wirehaired Fox Terrier. Idiopathic epilepsy itself is considered incurable, but the disease can be managed with the long-term use of drugs. These medications typically serve to raise the brain’s resistance to the abnormal electrical impulses that trigger seizures. 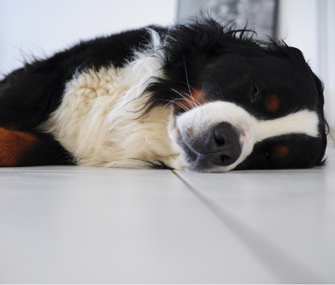 The most common drug used for dogs is phenobarbital, but several other choices exist for chronic therapy if this drug produces intolerable side effects or if seizures remain uncontrolled. Unfortunately, almost all other drug choices are significantly more expensive. In almost all cases in which drug therapy is elected, frequent monitoring of these patients (typically through serial lab work) is necessary. For more severe sufferers, however, treatment may also include hospitalization to manage more severe episodes during which prolonged seizure activity can lead to life-threatening consequences. Some dogs, however, may not require any treatment at all. Dogs with infrequent seizures may, in fact, be more amenable to experiencing the occasional seizure than to risking the side effects of the drugs used to treat them. There is no known mode of prevention for idiopathic epilepsy save a dedicated breeding program that seeks to eradicate the trait via sterilization of affected animals and at least all first-degree relatives. Some seizures may be prevented by avoiding specific drugs that can reduce the seizure threshold.